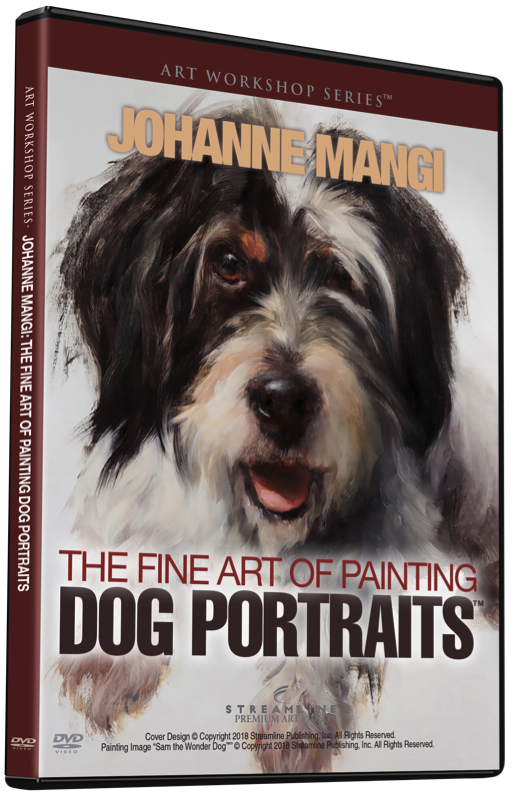 Streamline Premium Art Videos has just released a new instructional video from Johanne Mangi titled The Fine Art of Painting Dog Portraits. Mangi is a renowned animal painter who has been asked to exhibit at the National Arts Club and Portraits Inc. in New York City. This video training is conducted by renowned animal painter Johanne Mangi, who has been asked to exhibit at the National Arts Club and Portraits, Inc. in New York City, as well as other high-profile venues. With her guidance, students will learn how to emphasize unique personality and expressions in their animal portraits as they follow along with her step-by-step painting demonstration. The lesson begins with a study of the subject, in life and in photos, to understand structure, anatomy, and details needed to learn how to make a strong composition. Students follow along to complete a painting of a dog, starting with a simple block-in, then laying on paint directly and quickly. Johanne paints on a smooth surface with an oil ground, which allows for quick application and removal of paint — great for juicy strokes, “adding” light areas, adjusting values, and fixing mistakes. Students will enjoy bringing their pet portraits to life with the painting lessons in this video! The Fine Art of Painting Dog Portraits is now available on DVD and streaming video through Streamline Premium Art Video. Johanne Mangi paints a variety of subjects, but her passion and inspiration is painting dogs. She is an active member of The Salmagundi Club, and her work has been exhibited at the National Arts Club and Portraits, Inc. in NYC, as well as other high-profile venues. A self-directed artist, Johanne has worked and studied with a variety of artists and hosts workshops of her own, with the unique feature of having live animals present so students can be encouraged to paint from life. Streamline Premium Art Videos was created because we believe art videos should reflect the quality of the artists and their artwork, with videos delving into the mindset of each artist. Each video is tastefully created, starting with proper lighting and sound as well as multiple camera angles. Our goal is to offer the viewer a higher-quality experience and more for their investment, so they can understand the thinking behind each step of a demonstration and virtually feel every brushstroke. Each artist is interviewed by an art expert, such as our editors or publisher, to help you understand everything that goes into a work of art. As we do in our magazines, our goal is to tell the full story, in depth and with a true feel for the artist. If you’d like a link to review this video for free and provide a testimonial, please contact Sue Henry at suehenrystreamline@gmail.com.